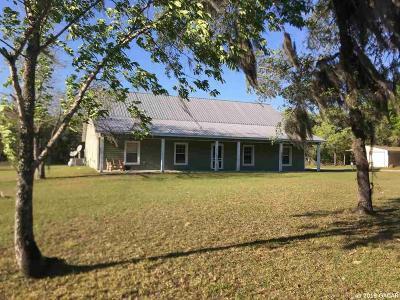 Come on out to Levy County and consider this 2007 custom farm house styled home on 8 private acres! Enter in front door to spacious and open living room with rock fireplace. Living room open to large dream kitchen with custom cabinetry, granite counters, stainless upgraded appliances including side by side counter depth refrigerator/freezer, 5 burner gas range with electric oven, additional built in wall oven/microwave, oversize vent hood, &dishwasher. Bonus room off kitchen perfect for office, playroom or sewing/craft area. Separate laundry room with large front load washer/dryer & tankless hotwater system. FIVE (5) bedrooms and 3 full baths that also feature custom cabinets and granite. All additional acreage is completely wooded. Lots of room for animals too!! Loads of value here! © 2019 Gainesville Alachua County AOR All rights reserved. Information deemed to be reliable but not guaranteed. The data relating to real estate for sale on this website comes in part from the Broker Reciprocitysm Program. Real estate listings held by brokerage firms other than are marked with the BR logo and detailed information about them includes the name of the listing brokers. Listing broker has attempted to offer accurate data, but buyers are advised to confirm all items. Information last updated on 2019-04-23.